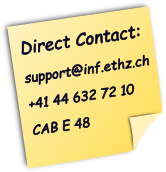 Providing IT services and support to students and researchers of the Department of Computer Science of ETH Zurich, all of whom are IT experts, is a challenge all by itself. The IT Service Group is up to the task, and we do our best to provide a solid infrastructure for our customers and help in all situations. More and more research groups switch from a static VLAN configuration on the office UTP plugs to MAC Authentication Bypass (MAB). 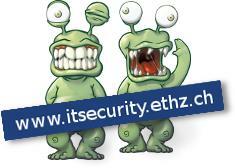 This has benefits for users but also requires some considerations regarding security. If you have an issue with IT or want to use one of our services then please check our support and help section. Information for our various customers groups can be found here. You are always welcome to contact our service desk and talk to our staff. Find out who is your IT Coordinator. Currently there are no known service interruptions.